The entire Russian Olympic team will today be banned from competing at the Rio Games next month, The Mail on Sunday understands. According to well-placed sources, the International Olympic Committee will punish all 387 Russian sportsmen and women in the strongest possible way after revelations of their country’s state-sponsored doping programme shocked the world. The country’s corrupt track and field stars have already been banned from the Games, and last week lost a desperate legal challenge to overturn that decision. But today’s ruling – the most momentous in Olympic history – will see Russia’s medal hopes in cycling, judo, wrestling and all other disciplines excluded from competition in the wake of the scandal. The controversy involved President Vladimir Putin’s sports ministry handing out cocktails of steroids and covering up tainted urine samples ahead of the 2012 London Olympics. As well as excluding Russian athletes from the forthcoming Games, senior IOC figures are also advocating a ban for the 2018 Winter Olympics in South Korea. An Olympic insider told the MoS: ‘The IOC want to ban Russia to show [doping] is an assault on the whole of sport. To this end, a small number of Russian athletes who train abroad, subject to stringent anti-doping procedures and demonstrably free of Russia’s sphere of corruption, may be offered a lifeline to compete in Rio under a neutral flag. 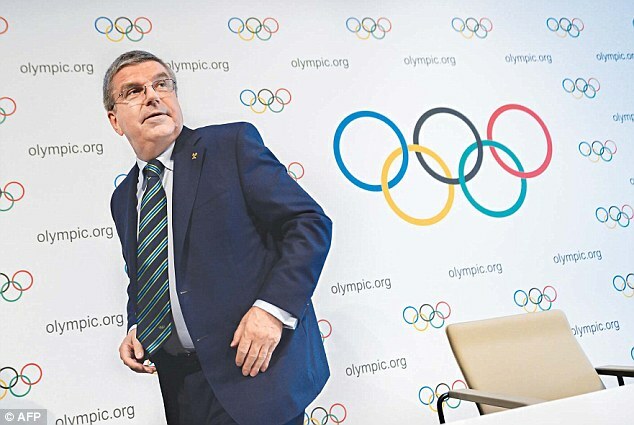 It is understood that the Committee, based in Lausanne, Switzerland, will ask each international federation, the bodies responsible for individual Olympic sports, to examine the personal merits of potential Russian athletes, to assess whether they can compete as exceptional cases. Two have already received dispensation to compete in Brazil – Yuliya Stepanova, the 800m runner and a key whistleblower in the doping scandal, and long jumper Darya Klishina, who is based and tested in Florida. The IOC’s bombshell decision is likely to enrage Mr Putin, but it is unclear whether he and other Russian dignitaries will boycott the Games.